You can use many fabrics, but fabrics which are durable and work well are canvas or cotton duck. Other heavy fabrics you might consider are twills, drills, denims or other heavy home decorator fabrics. If you find those for a good price, or you want a particular printed fabric, it is worth trying any of those fabrics for the bags. A yard of fabric, at least 52” wide, will make two canvas bags. For each bag, you also need at least a yard of 1”-wide cotton webbing, or also called belting, for the handles. If you have a heavy duty sewing machine, you should consider using heavyweight cotton webbing, if you can find it, as the handles are often the first part of the bag to wear out when you use lighter webbing. Belting is usually located in the notions area at your local fabric store, but you can also buy online from sources like Greenberg & Hammer, either by the yard or by the bolt. Helpful search terms are “belting” or “cotton webbing.” If you’re going to make many of these bags, there are a number of sources for the belting at really low prices if you buy at least 50 yards. One source where I bought mine is Jontay Distributing. If you are able, it’s always good to prewash the fabric and belting before you cut it. Though, as these are bags and not form-fitted clothes, a bit of shrinkage in the finished product won’t make much difference. If you do prewash, wash with the hottest water setting on your machine so it maximizes the shrinkage before cutting. Most canvas comes in 60” widths, but shrinks down at least a couple of inches after washing. That’s fine, you only need fabric that is 52” wide for the pattern we are using. (If you can only find 45” wide fabric, the pattern can be rearranged to fit your fabric.) The pattern diagram for two canvas bags from 1 yard of fabric is shown below. Each bag is made of up a piece that is 16”x36” and two side pieces, each 8”x15¼” plus two handles that are 18” each. Cut out the pattern in a way convenient for you. We tend to cut off and discard the selvage first (because it doesn’t shrink the same amount as the rest of the fabric and so never lies flat). 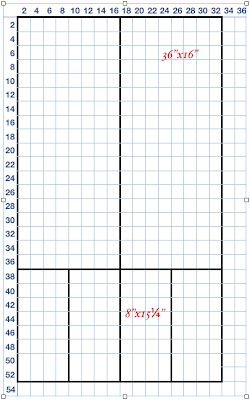 The cutting diagram is shown for fabric at least 52” wide. Serge or zig zag the raw edge of each of the short ends of the large “body” piece of the bag and one of the skinny edges on each of the side panels. (Don’t worry about the rest of the edges yet, they’ll get finished during construction). Fold the large piece in half and mark the center with a pin. Do the same with one of the small pieces, on the short edge. Match the pins and pin the small piece to the large piece, as shown in the pinning diagram. Mark in from the ends on the small piece a space equal to your 5/8” seam allowance. 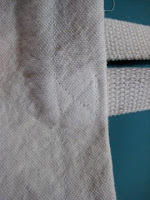 Run a seam along that edge, from mark to mark as shown in the photograph (do not sew all the way from edge to edge). If your sewing machine has a reverse or “tacking” function, it is a good idea to back up on your stitches at each end in order to “lock” your seam. That way the seam won’t loosen while you are doing the rest of the assembly. Repeat the process for the other side piece. Next you need to snip the large piece of fabric so you can turn it to sew the other edge. You want place a cut in the fabric at the point where you made the mark. Cut up nearly to your seam, but not all the way to it. 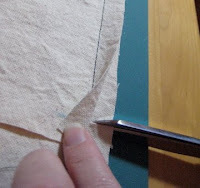 Once you’ve cut the large fabric, you can turn the fabric and pin the edge. Sew it down the length. Repeat for all three remaining corners. Now, you’ll want to either serge or zig zag over all of the raw edges. This will prolong the life of your bag as it will help prevent fraying or unravelling. There is no exact correct positioning of the handles. We apply them with about a 4” gap between their attachment points. Mark the center of the edge of the fabric and measure out an equal distance on either side and mark the fabric. Lay the handle webbing down next to the mark, with a 1” overlap with the canvas and pin in down. Sew it down on the fabric. Do the same with the second side. Fold down the top edge of the bag 1”, tucking the handle to the inside of the bag. 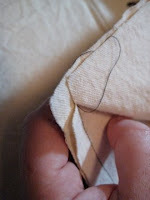 Sew along the serged or zig-zagged edge with a secure seam. Trim or tie off whatever threads are hanging. You don’t want them catching on stuff and pulling out your seams. Congratulations, you have made a shopping bag! This is a handout I made up last year on how to make the canvas bags. I've had a couple requests for directions on how to make them, so I decided to post the info from the handout here.